GOJU KAI KARATE DO AUSTRALIA ~I.K.G.A. WRITTEN BY GOGEN YAMAGUCHI TO PAUL STARLING. Thank you for taking the time to visit this website of Goju Kai Karate do School of Yamaguchi. This style was established in 1963 in Sydney Australia. 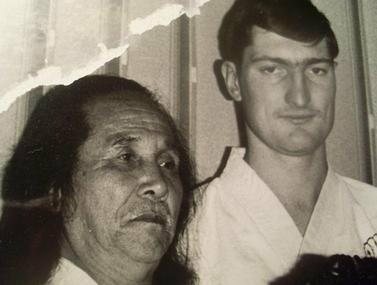 The Australian branch of Goju Kai has a very long standing tradition of an unbroken lineage directly to Grandmaster Gogen Yamaguchi and hence his successor and third son Goshi Yamaguchi now 8th Dan and Hanshi. [International Karate do Goju Kai Association]. Australia is a continent as large as North America and distances between states have always been prohibitive, yet Goju Kai has continued to flourish here during the past 52 years, largely as a result of the combined efforts of the Shihan instructors located in New South Wales, Victoria & Western Australia and Queensland. Although each Chief Instructor has their own unique and individual method of teaching and running their Dojo, they are united in a determined stance of loyalty and respect for the Yamaguchi family and for Yamaguchi Goshi Shihan. Perhaps it could be argued that the strength of Goju Kai Karate do in Australia comes from the fact that the most senior Instructors here are of a very high rank, [at least 7th Dan], and that, of these Instructors and their Senior students, each has been training and teaching for at least 30-50 years. At the same time, training with these Instructors are many other Shihan Instructors of 5th Dan and 6th Dan Rank who have also each been training and teaching for approximately 25-45 years. We are proud to study the way of Goju Ryu. We respect the Budo spirit of traditional martial arts. The Australian branch of Yamaguchi Goju-Kai maintains a strong link with the Japanese Headquarters of IKGA. Grandmaster Goshi Yamaguchi Saiko Shihan visits our Country on a regular basis (usually every 2 years), and since the 1960's Australia has frequently sent individuals as well as large groups of students and Instructors to Japan, ensuring that Australia keeps up to date with the latest methods of teaching and training. It has been said that outside of Japan and the United States school of Gosei Yamaguchi Shihan that Australia has the longest history of Goju-Kai Karate-Do associated with the Yamaguchi Family. We are proud of the fact that we now have fourteen Shihan Instructors in the Australian branch of the IKGA, which is explained by our 50 year + history. We hope that you will find time to sign our guestbook; to navigate this site please either view the pages that interest you from the Home Page/Site Map, or otherwise please press the last navigation link at the top & bottom of each page titled 'NEXT'. As this site is continually being modified, we hope that you will bookmark the Home Page, and return intermittently, pressing the RELOAD button, to view a regularly updated version of the site. The International Karate do Goju Kai Association, currently have Dojo in 60+ different countries throughout the world, and we hope that you will navigate and explore the various Websites of our worldwide association. Members may also be interested to attend European, Canadian, Australian, African, South American or Asian Summer and Winter camps held regularly and taught by Goshi Yamaguchi Shihan. Sydney members have previously attended Seminars in Sweden,Karlsgogaar, Corfu-Greece & Japan,and Western Australians & Victorians attended Championships & Seminars in Japan, India Malaysia & Brazil and beyond. All queries to Paul Starling Vice President I.K.G.A.